When I bought my townhouse, it came with a normal townhouse-sized yard. I assumed electric would be the best route for a townhouse, since the yard wasn't large and I don't have outside storage such as a shed. I was WRONG! There are so many things I regret about buying this electric mower. First, it has very little power. Gas mowers spin the blade much, much faster and have a mechanism to help propel the mower forward. With the electric unit, you must push/pull twice as hard AND re-cut over the same spot at least twice to ensure you've hit the blades. Secondly, the cord is VERY annoying. I originally thought it would be more annoying to fiddle with gas and occasional oil changes. Boy, do I miss the freedom of just being able to move anywhere. Next, I still have to store it outside anyway! I thought it would be smaller and cleaner than a gas machine. It's very dirty and just as large. It can not be stored inside after normal use. Further, because it's stored outside now, I think it may damage more quickly in the elements than a gas machine would because it's simply plastic. Last, it's more expensive than a gas unit! I assumed the electric would be the cheaper way to go. I had an MM525 that I liked and lightly used for 3 years on a small yard. But then the motor died - a piece of the rotor broke off and destroyed the brushes. Bang! B&D wanted $173 for new one! So I went and bought an almost new Taskforce 20" 12A mower off Craigslist for $80. It is as close to the size of the MM525 as you can get. Guess what? It cuts better, runs quieter and the height is easier to adjust that the B&D. A much better mower. You have been warned. 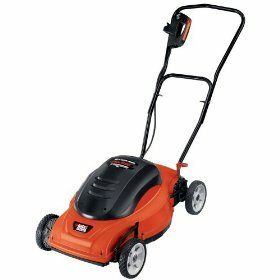 I've had an electric Black & Decker Lawn Hog Mulching Mower, model MM-575, for more than three years now. I bought it at the local Sears store. I think it's a great value for the price. It cuts an 18 inch wide swath and, as long as the grass isn't too tall or wet, it has adequate power. The entire body and underside of the mower is plastic, which makes cleaning it a breeze; all I have to do is take the garden hose spray nozzle and blast the grass out from under the deck and from the wheels. The mower is light enough to maneuver without too much muscle, but with the yard surrounded by fencing I wish I had gotten a mower with a “flip-over” handle. Maybe next time. The only other thing I'd change is to make the blade out of harder steel; the mild steel edges are easy to sharpen, but they tend to notch badly when they hit a solid obstruction. Also it turned out to be very difficult to remove the blade from the shaft for sharpening, so I got a special grinding wheel (from Sears also) to chuck into a drill that lets me sharpen it without having to remove it. Of course the electrical cord trailing along with you can be a nuisance, but with proper planning and holding it in one hand to guide it along, it's something you can get used to. As far as reliability and lifespan are concerned, I have no complaints at all about this electric mower. I recommend it to anyone with a relatively small yard.